Kisah benar.. especially nombor 10.. I very much agree with these…. Hi! I’d love to repub this to the site I work for, but I can’t seem to find the original author’s contact info anywhere? Get in touch with me on Twitter if you’re interested. Hi. I’m having some problems with Twitter right now so I can’t seem to msg you. I’ll try again tonight. Hey! Sorry, it didn’t notify me when you responded — I’m still interested in reposting this! You can email me at matt@matadornetwork.com if that’s easier. 11: You bow when ever you say thank you or yes, even on the phone. 12: You speak way too S L O W L Y and with perfect P R O N U N C I A T I O N to your friends and family back home. I am a biker living in Chiba, Japan. This is a great site to understand how you guys are enjoying things Japanese. So living in Japan turns you into an insufferable prick. Sure if your threshold for considering people insufferable pricks is that they like and understand something you don’t. You weebs are the worst. I speak literally five different languages. Yes this sometimes happens, but if you are having it happen this much then you are playing it up to make yourself feel better. Here’s a little known secret about web comics. They’re usually exaggerating quite a bit to make people laugh. 1 – 10 are all short-term effects. Long term effects are different. And worse. 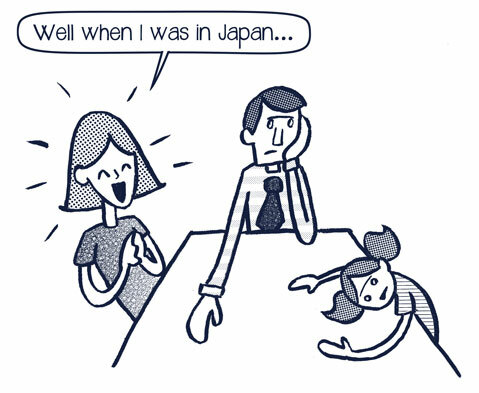 You see, in your gaijin bubble of specialness, you will be infantilized, no matter how good your Japanese is. For men, it leads to low testosterone and never actualizing fully as a man. For women, well, I am not a woman, so can’t comment first hand but let me just say that the ladies pay a price as well.